Hearst, Dorothy. Promise of the Wolves. Simon and Shuster, 2009. 363p. $16.00. 978-1416569992. 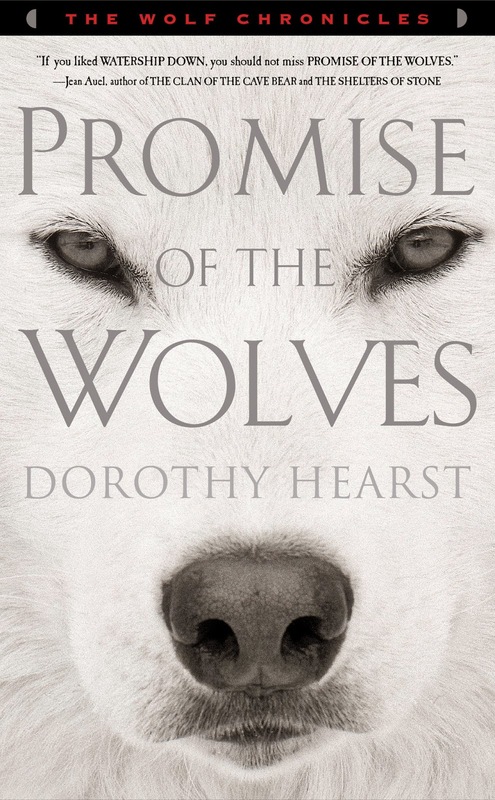 What is the promise of the wolf? Never consort with humans. Never kill a human unprovoked. Never allow a mixed-blood wolf to live. At least that's what the wolves of the Wide Valley believe. Until a young wolf dares to break the rules--and forever alters the relationship between wolves and the humans who share their world. 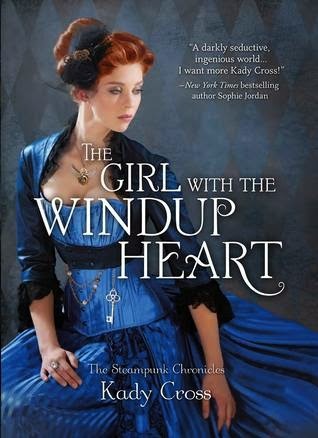 Read below to find out what book inspired a young Dorothy Hearst and how that influenced her series. There were so many books that influenced The Wolf Chronicles that I could never list them all. Here are some of the books I read as a pup—between the ages of eleven and thirteen—that I know led me to the wolves. I remember finishing A Wrinkle in Time, setting it down and thinking “I didn’t know you could do that.” I didn’t know that people were allowed to write about what was known, then—when arriving at what wasn’t known—make stuff up. I knew I wanted to do that. Peter Dickinson’s Changes trilogy is the story of England thrown back into the Middle Ages. I don’t want to give away the ending, but there’s a huge “what if” that drives the story. I had the same reaction at the end of it that I had to A Wrinkle in Time. You can do that? “What ifs” ended up at the center of The Wolf Chronicles. What if wolves domesticated us as much as we domesticated them? What if this story was told through the eyes of a young wolf who saves the life of a human child? And then there were all these wonderful gaps in our knowledge about wolf and human evolution that I could fill in with the story. When I set out to write about how the wolf became the dog from the wolf’s point of view, I wanted my wolves to be fully-drawn characters, and also realistic wolves. The first book I thought of was Watership Down, which a cousin had given me when I was eleven. I’d gobbled it up. When I started writing about Kaala’s adventures, I remembered how Adams had written his rabbits so that their needs and goals were as important as any human’s, and I modeled the wolves on that. I’d also been miffed that Adams’ female rabbits were so passive, so I got to set that right with Kaala. I read the first four Pern books the summer I was thirteen. I was entranced by the relationship between the riders and their dragons and, even more so, fifteen-year-old Menolly’s love for her fire lizards. To this day I can feel how much I wanted a fire lizard. The dragons and fire lizards had very clear personalities, but they were definitely not human. The connection between human and nonhuman stayed with me. The cousin who gave me Watership Down gave also gave me A Tree Grows in Brooklyn. I loved how Francie moved through a complex world with clear vision and a solid sense of herself. There was no breathlessness or silliness about Francie like there was in so many girl characters I’d read. I skipped through much of the adult perspectives and kept coming back to Francie and how she quietly, but steadily and firmly, found her way in the world. Check out all the stops on the Wolf Chronicles blog tour! Tune in tomorrow for a review and a chance to receive all 3 books in the series! Smith, Andrew. Grasshopper Jungle. Dutton (Penguin Group), Feb 2014. 388p. $18.99. Cover Appeal: Plain green with yellow pages (if you are lucky) will appeal to all with its brightness. Very eye-catching in its simplicity. Weird. From beginning to end. And yet, I couldn't stop reading. This is my second Andrew Smith book and both were different. 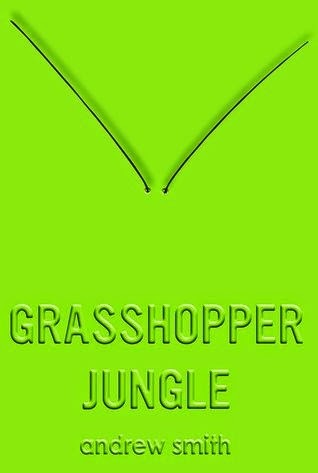 Grasshopper takes you through an incident of bullying, a breaking and entering, an attempt to get drunk, an underground lair, and some mutant grasshoppers who hatch from inside some randos throughout the story. The grasshoppers are key since they are pretty much impossible to stop. Or Unstoppable. Throughout this crazy story, Austin Szerba is constantly questioning his sexuality since he's attracted to both his girlfriend, Shannon, and his best friend, Robby. I had pretty much been dystopiad/post-apocalypticed out until I read this book. I'm hoping that more authors step out the box because I am tired of the same-o, same-o. Maybe not as crazy as this one. I recommend this for 9th and above. I always carry my sword in my backpack. Johnston, E.K. 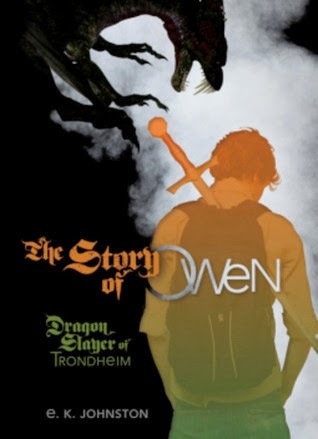 Story of Owen, The (Dragon Slayer of Trondheim, 1), Carolrhoda Lab. 2014. 302p. $17.95. 9781467710664. Cover Appeal: I think the front works better without the dragon on the cover. It's a cover students will look over because it's not bright and eye-catching. 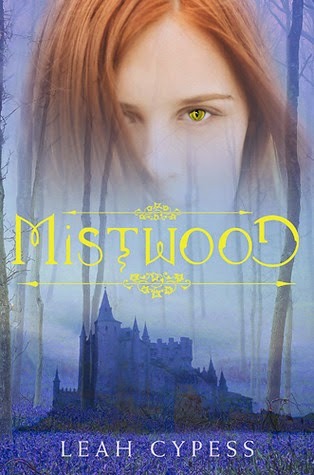 This is actually the story of Siobhan McQuaid, bard to Owen Thorskard, high school student and dragon slayer-in-training. Siobhan is the first person to befriend Owen when his family moves to Trondheim. Owen's family is special, his aunt Lottie is the most famous Dragon Slayer of this time and his dad, Aodhan, is no slouch either. They also bring with them Hannah, the best swordsmaker. They have raised Owen in a loving and kind household. Siobhan's family are no slouches either. As Owen and Siobhan's friendship grows, the family asks her to be Owen's bard. They want to shape the story of dragon slayers. There's a lot of talk about who controls the message and how. It's like you are reading two stories at once. And therein lies it's excellence. I recommend this for 7th grade and up. Singsongy Picture Books - Big Pumpkin is one of my favorite books. It was a joy to share it with students again. The repetition and rhythm make it fun to read aloud. The Ghosts Go Haunting is thisclose to the tune in the Ants Go Marching. The beauty here is you don't have to sing the whole book - I modified based on grade but we all heard the book this week. It was fun flapping, clomping, and WOEing through the library. Halloween is coming - I read First Halloween with kindergartners and we discussed similarities and differences. We also read The Teeny Tiny Ghost and talked about how Halloween can be scary and fun. We also watched the first minute or two of It's the Great Pumpkin, Charlie Brown and talked about pumpkin carving. CYBILS - wowza - Seems like I'm pretty much reading my backside off. Because I'm sitting on it. Reading. Constantly. I have to go read now. If you want some reading ideas - check out TeachMentorTexts and don't forget to link your reads to her blog! Happy reading. Just in time for NaNoWriMo! 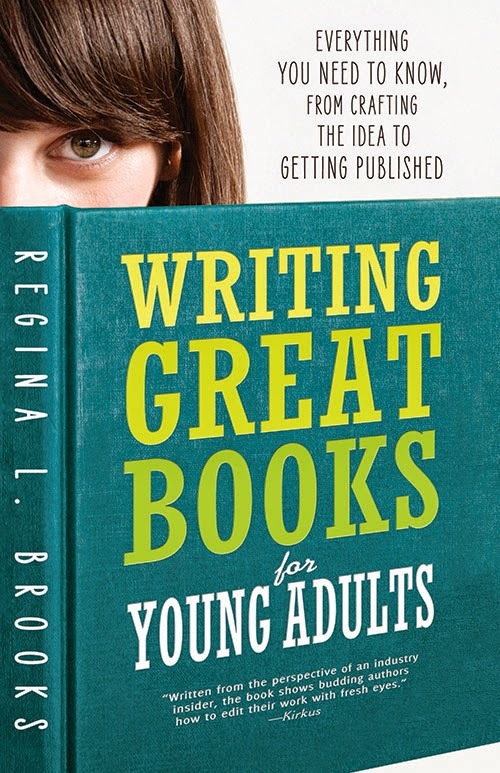 Are you looking for some inspiration to write your own novel? Open to US Residents only. 13 years of age and older. 1 entry per person/email. Closes October 24, 2014 , 11:59 pm. EST. Winner announced October 26th. UPDATE: Congratulations, Stephanie. Expect your book directly from the publisher. 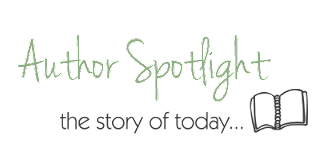 Regina L. Brooks is the founder of Serendipity Literary Agency and has been developing award-winning authors and books for over a decade. 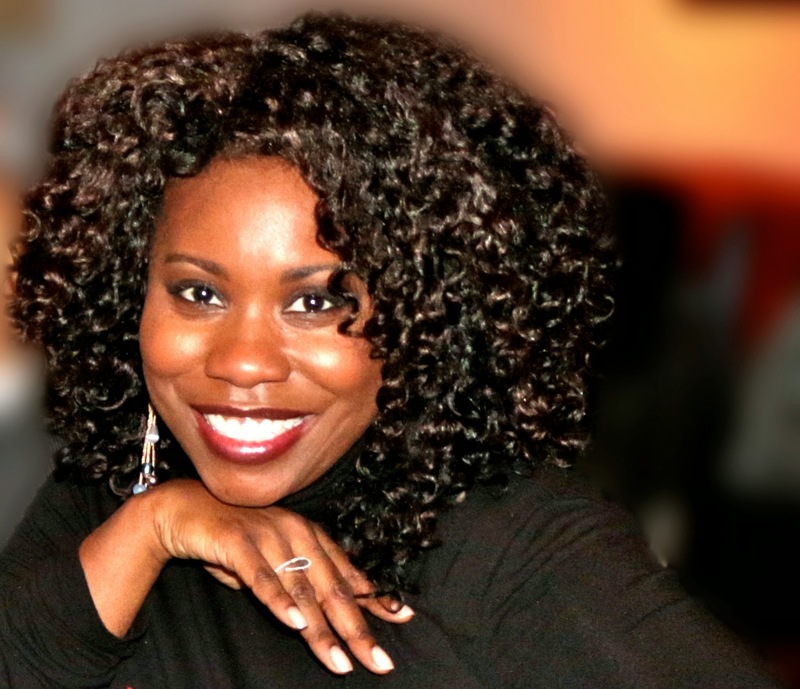 She has been highlighted in several national and international magazines and periodicals, including Poets and Writers, Essence, Writer’s Digest, and Sister2Sister,Forbes, Media Bistro, Ebony, and Jet. She lives in New York City. Picture Books - I've always read picture books but usually just for myself or to promote to teachers for writing mentors. Now I'm reading them as possible readalouds for my younger students. By far our favorite of this group was Creepy Carrots. Loved by all from K - 3. Great for leading up to Halloween and can be enjoyed on different level. We enjoyed the Pete the Cat videos more than the books - basically because we love music. And you must read Ball. That was ingenious! But Fall Leaves, Number One Sam, nor Nuts at Bedtime ever made it to a classroom audience. Re-Read - Finished my reread of The Heroes of Olympus series and devoured the final book, Blood of Olympus. I think Riordan left just enough open to re-visit in the future but answered enough questions to feel like a satisfying ending. I look forward to his Nordic Adventures. Book Clubs - Next book club reads are Graceling by Kristin Cashore, which will be a re-read for me, and The Bully Pulpit which is so long and not one I'm looking forward to reading. I may not make that book club meeting! CYBILS - The nominations are closed. We are furiously reading these titles and I will try to write a word or two about some of the ones I read as I go along. Lots of reading ahead! Need more reading suggestions? Check out Teach.Mentor.Texts and don't forget to add your link while you are there! Hale, Shannon. 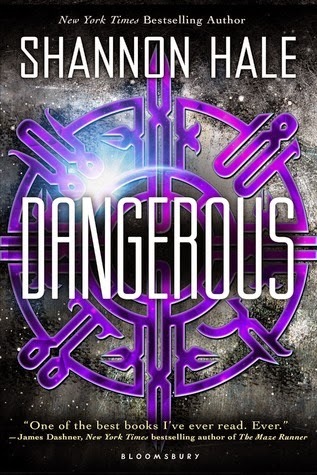 Dangerous. Bloomsbury Publishing, 4/2014. 416p. $17.99. 9781599901688. Cover Appeal: Nothing sets this apart from any other science fiction title out now. I do like the purple and gray though. I also like the font used for the title. Maisie Danger Brown is tired of her boring life. She's homeschooled with her best friend, Luther and both her parents work from home. They never go any where or do anything exciting. She figures it's because they don't have enough money. Along comes a sweepstakes to win a trip to astronaut camp. Now Maisie has a chance to live up to her middle name. She becomes part of an elite team who isn't sure what their purpose is but are sure they need to work together. For the most part the book is all about the science of space travel and gadget building with moments of romance and intrigue thrown in. I was happy to see Maisie pull herself from the brink of losing her sense of self over a boy though she was aware that it could happen and she fought it. She was a strong character who thought carefully about how her actions affect others. I enjoyed seeing her thought process. The aliens were bit underwhelming and the rest of the characters, Jacques, Mi-sun, and Ruth, could have used a bit more depth. Luther, even though he was only in the book a short time, was one of my favorite characters. 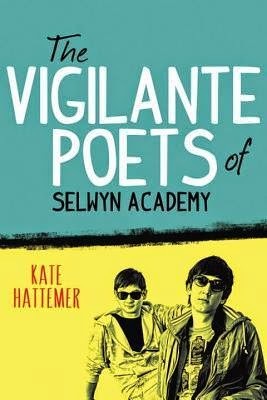 I recommend this one for 7th Gr and above. I'm starting a new job this fall at a preK-8 independent school. I'll still be the librarian but I have some new duties. The K-4 students will come to the library weekly and I get to do readalouds! I asked twitter for help! What Happened to Marian's Book? The suggestions were coming fast and I tried to favorite them all! Thank you, twitter friends, for your generous help! I'm going to review the curriculum guide to pick some longer readalouds for Grades 3 and 4. 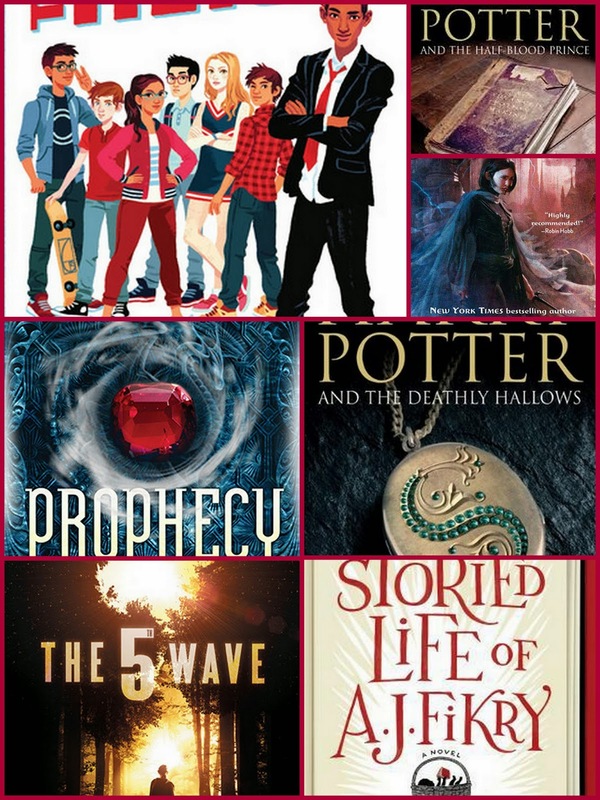 I'm hoping I can do something with genres for either 3rd or 4th and get into a Mock Newbery Club with 4th - 8th. What are your suggestions? How can the library support the classroom with readalouds and other lessons? Haven't blogged in awhile. Lots of stuff happening. These are the books I've read in the past month and half! A fair amount but nothing like the good old days. Some don't miss books were Secret Hum of a Daisy, Sisters, Absolutely Almost, and Naked! I was happy to finish the Ascendance Trilogy and can't wait to talk it up at the new place. I need to re-read Chasing the Milky Way by Erin Moulton so I can do a proper review. Will be moving to a new job so will talk about that in upcoming issues. Happy Reading! 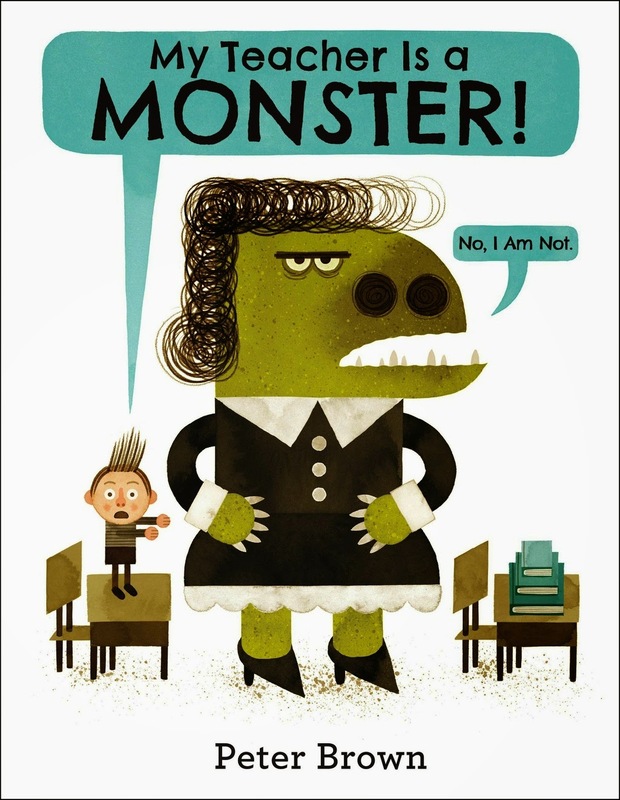 Labels: #nerdybookclub, It's Monday What Are You Reading? Not my usual fare. 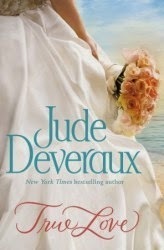 It's been a billion years since I read any Jude Deveraux. I'd been looking for a romance and I also wanted to read about Nantucket (never been but makes me think of summer) and someone on Goodreads had just finished this one. Luckily, they had it at the public library - on Overdrive. Alix is an architect student who gets sent to live in the Kingsley House on Nantucket as part of the will of one of her mom's closest friends. She can live there for a year and work on her culminating project for architecture school. Kingsley House happens to belong to Jared Kinglsey Montgomery - a famous architect whom Alix admires and would love to have look at her drawings. (snicker). Jared would rather not, especially since he knows a great deal about Alix that he needs to keep secret. Another resident of the Kingsley house is Jared's grandfather, Caleb. His five-times great, dead grandfather. Caleb can only be seen by certain family members and he is hoping that somehow, he can connect with Alix and she can help him move on. Despite the contrived storyline of past and present overlapping, this was fun. I will actually read the second book. There is something about summer that makes me want to just read romance and fantasy books. Hopefully combined into one awesome package. I often pass over books I need to read in search of books that have that magic ingredient that is designed to transport me into the book as a side character. And while I've found some decent romance novels and some good fantasy, these aren't the books I'm looking for. That aside, I did have some good reads these past two weeks. Loved the ending to Bardugo's Grisha Trilogy, all the while she had me thinking she was bringing me to one place and we ended up somewhere far better. I was pleased at having so many questions answered as lately it seems series novels either don't want to end or the author wants you to decide what happens to the characrer. While I'm all for inference and predictions and some ambiguity - I want a mostly complete story - especially if it's the last book in the series. We continue our quest for a book to use for our One Book program in February - hence the James Patterson novel. 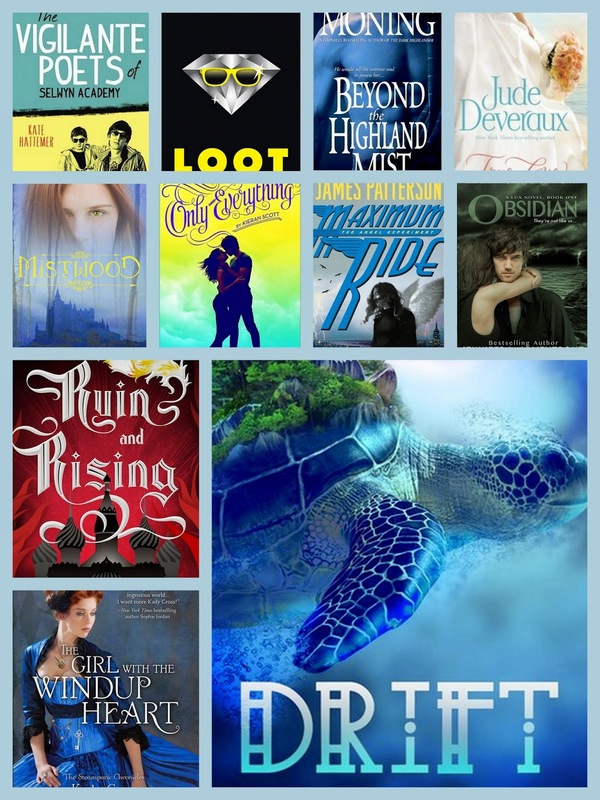 And #WeNeedDiverseBooks (still) so check out MK Hutchins book Drift and read here as she talks about Obsidian and how it's used in her novel. Labels: #nerdybookclub, #WeNeedDiverseBooks, It's Monday What Are You Reading? The end of a trilogy is always sad. This one had me tossing aside my chores (kidding, that's all books really) and glued to the pages. Last year, I re-read Shadow and Bone before Siege and Storm came out but I neglected to re-read Siege and Storm this year. No matter. 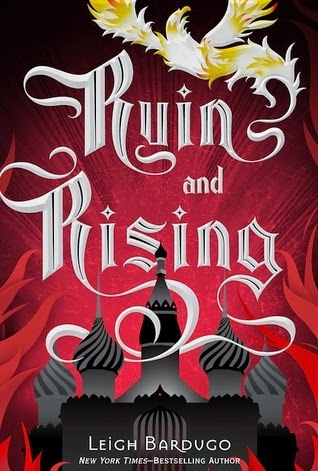 Bardugo helped us pick up pretty much where we left off. This installment had more of the Lantsov Prince, thankfully. I love his character. The wit and cunning, oh how I wish he and I were friends. And he was real, of course. There was a moment when I had to put the book aside when I could NOT believe what happened. My heart stopped. This was a (mostly) satisfying end. I would love to read a follow-up but it will not be necessary to the story - just to my heart. Hutchins, M.K. Drift. Tu Books (Lee and Low), 2014. 392p. $19.95. 978-1-62014-145-8. 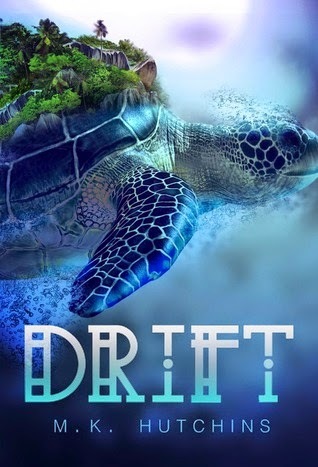 Pick up your copy of Drift (affiliate links) Amazon | Indiebound and stop by tomorrow for my review. Drift follows Tenjat, 17 as he tries to carve out a life for his sister Eflet and himself. They lost their parents five years ago as they were escaping their previous island home, Island Ita. Tenjat is determined to escape the life of a farmer hub and become a Handler on Island Gunaji to give Eflet the future she deserves. The future he promised his father he would give her. Read on as M.K. Hutchins talks about flintknapping obsidian and how that helped define her worldbuilding in Drift. Years ago I sat in a room with a tarp-blanketed floor, holding a chunk of obsidian in my hand. Some of the exterior of the rock remained – gray and pitted like a crumbling piece of city sidewalk. Inside, though, the obsidian gleamed: black as ink, glossy and glittering as polished jewelry. The stuff is practically magic. Using a piece of antler or a round, smooth stone, I struck at the obsidian, trying to fracture off a long flake in a process known as flintknapping. Any badly-angled strikes could produce a bad flake or – worse – cause imperfections inside the stone that would make further flintknapping difficult. My protective leather gloves were soon spiderwebbed with thin cuts, even though I worked with care. Freshly flintknapped obsidian is far sharper than surgical steel scalpels. When the class was over, we gathered up those tarps and safely disposed of the obsidian in accordance with hazardous waste regulations. Beyond the beauty and the skill and the danger, I also admired the technology I was trying to learn. It would be wasteful to take one chunk of obsidian and knap it down into a single tool. Ancient peoples figured out how to make cores. They looked somewhat like tapering cylinders with a flat striking platform on top. From that platform, an experienced flintknapper could knock of blade after blade, utilizing almost every bit of the beautiful stone. And the Classic Maya were virtuosos of flintknapping. They didn’t just make tools and weapons, they made art, called flint eccentrics. By striking off flakes, they crafted delicate, graceful patterns and profiles of human faces. Every time I look at one of these, I think of how one misplaced blow during the manufacturing process could have snapped and ruined the entire thing. The technology to create these is lost – modern flintknappers can’t recreate them. I never became a great flintknapper, but I’m still a little obsessed with obsidian. Fantasy is a genre defined by setting. It’s part of the reason that I, at least, read fantasy. I want to become immersed in a world, in the smells and sounds and tastes. Drift was largely inspired by Maya mythology, and I wanted to pay homage to that. Often, fantasy is a realm of swords, blacksmiths, and horses, but I wanted to step away from that. I wanted jungles and plaster, howler monkeys and turkeys. 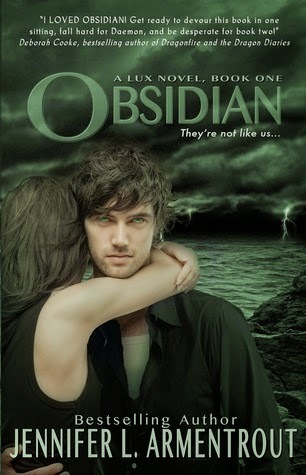 And I wanted obsidian – with all its danger and beauty. In the novel, the use of stone tools is just one aspect about the world, but it made the world more real to me. June 20: Supernatural Snark – M.K. Hutchins on being inspired by Maya mythology here. June 23: It’s All About Books – M.K. Hutchins’ top 5 most influential books here. June 25: Read Now Sleep Later - Drift GIVEAWAY here. Our goal for our One Book, One School program is to encourage students to choose reading as one of their recreational activities. We look for books that make students want to turn the page and read on, and if there is a second book, to want to read that book also. In the 5th Wave, aliens are invading the earth and killing off the population. They are doing it in waves and four waves have passed already. 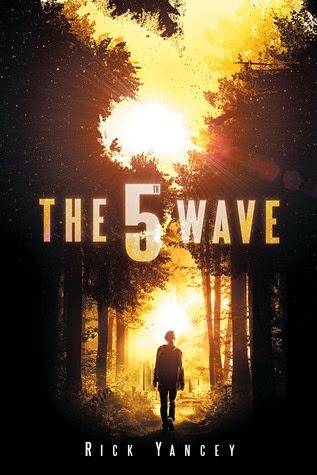 The few people who are left are trying to survive and plan for the 5th wave. Cassie is hiding out in the woods, trying to make her way to Wright-Patterson where she believes her little brother, Sammy, has been taken. Although Cassie's is the main story, we also hear from Evan, another survivor who helps Cassie out, and Ben Parrish, a soldier. Their stories overlapped in a way I predicted but the outcome is not one I suspected. 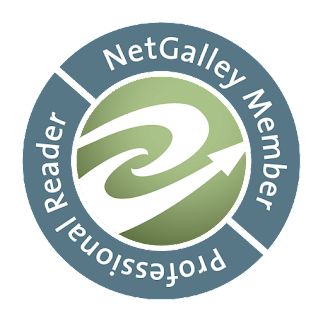 One criteria we have is the book we choose should hook you within the first 75 pages. This is not that book. No matter how much I enjoyed reading The 5th Wave once I got hooked, it won't work for our purposes. Though, I can't wait to pick up The Infinite Sea in September and this time I won't wait a year to read it! Is part of your job getting books into the hands of youngsters? Well, get ready to decrease those TBR Piles! 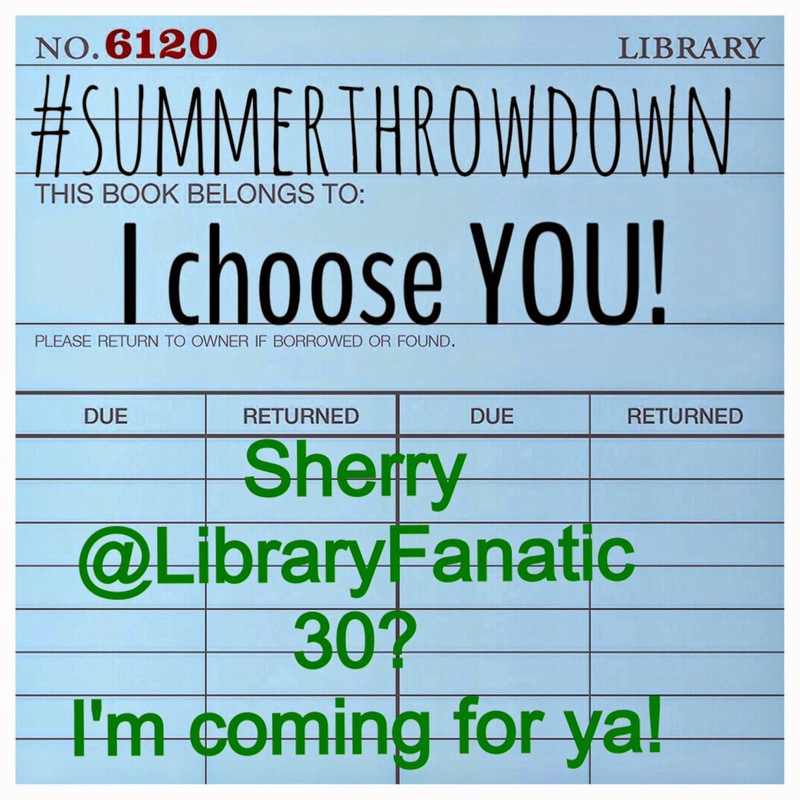 Brian (@BrianWyzlic), Jillian Hiese (@HeiseReads) and Sherry Gick (@LibraryFanatic) are excited to welcome you back to The Third Annual #SummerThrowdown! 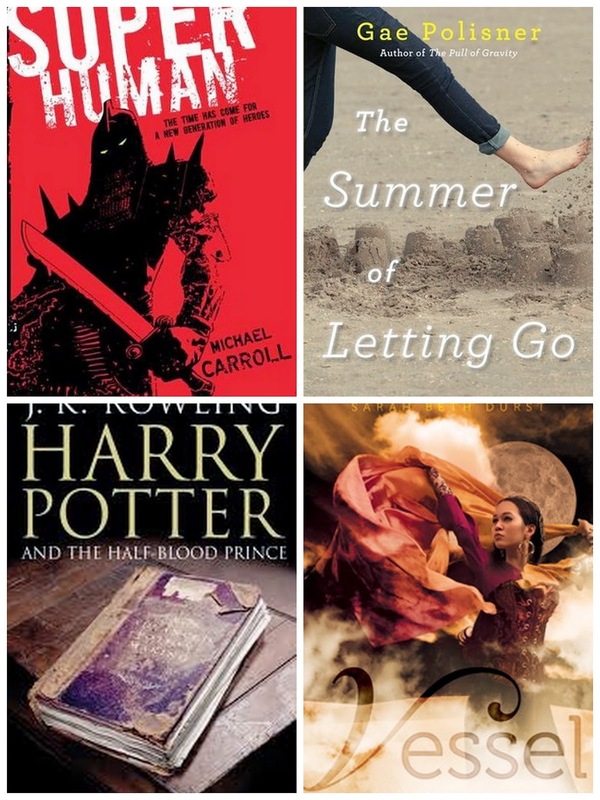 Summer Throwdown is all about reading as much as you can so that you can bring new titles to your students in the fall. It started out as a contest between School Librarians and Teachers and just evolved! Every book you read or listen to counts as 1 book. Every.Book.Counts! Each time you read a book, enter it on the spreadsheet. At the end of the month, let's see how you did! In order to satisfy those with a friendly competitive spirit (ME!) - we are encouraging you to do Callout Challenges! Choose a friend and challenge them to read a certain number of books. Then, over the course of July, let them know how many books you are reading and give them a little ribbing! This is totally optional! I've been called out by non other than Sherry (@LibraryFanatic)! I accept Sherry's challenge to read 30 books and offer her one of my own - NO PICTURE BOOKS! What say you Sherry?? Again, this challenge is optional! 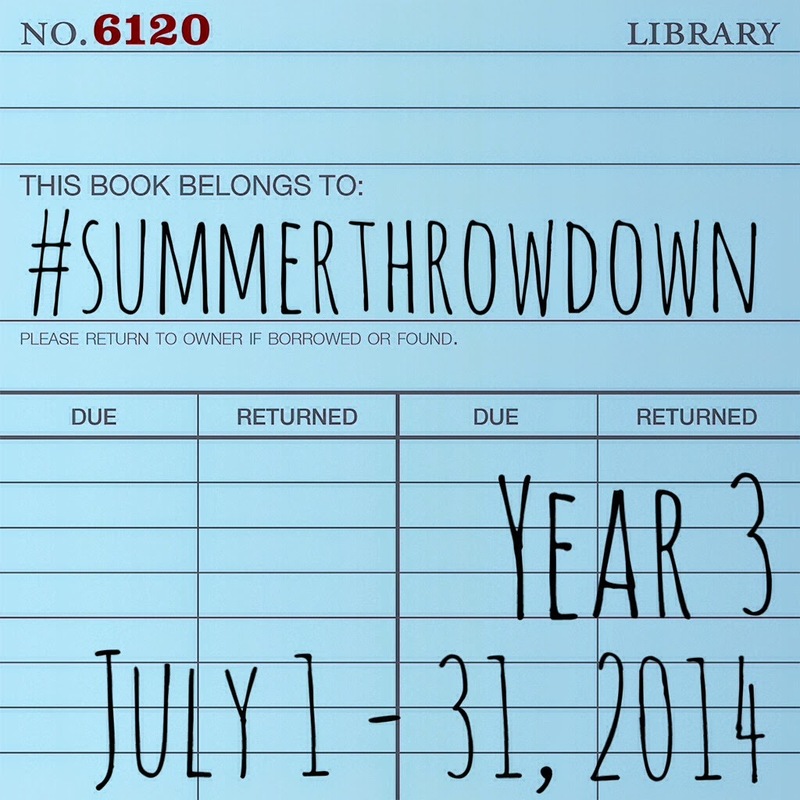 The only thing you need to participate in #SummerThrowdown is a willingness to read and record your reading! 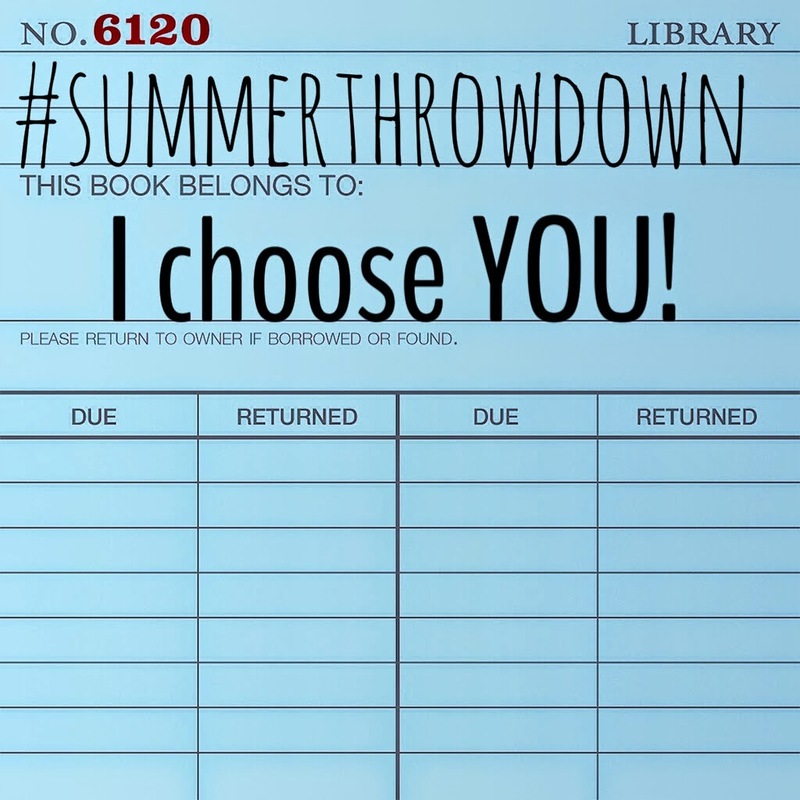 We do ask if you are on Twitter, Facebook, Instagram, Pinterest, Google+ or other social media - you use it as you are reading and add the #SummerThrowdown hashtag! Head on over to the #SummerThrowdown Spreadsheet to sign up! As a fan of Brandon Sanderson and his extensive world-building (see my attempt to catalog The Way of Kings here, here, here, and here) I was eager to find out how his earlier writing compares to his more recent work. 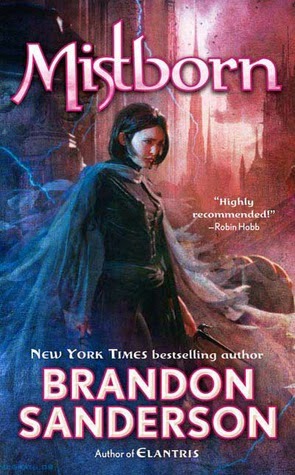 Mistborn is his second published work after Elantris, which I have around here somewhere too. As much as I can tell, there are two major types of magic in Mistborn, Allomancy and Feruchemy. Allomancers gain power by downing metals. They can increase their vision by burning tin or their strentght by burning pewter. Some Allomancers can only use one type of metals (there are at least 10, possibly 11) but Mistborns can use them all. Feruchemists use their own bodies to gain power, which they store in metals until needed. They can store up youth when they want to appear younger or strenghth when they need muscle power. Mistborn follows Vin, a street thief, as she is caught up into a new thieving crew whose goal is to take down the Lord Ruler. The crew is led by the legendary Kelsier, the only known survivor of the Halthisn Pits. Vin doesn't trust anyone on the crew. She goes along with them because she's interested in learning more about the gift of Luck that she has. It turns out she is a true Mistborn and what she calls luck is a form of changing peoples emotions. She can Soothe or Riot them. She also has many other powers. What follows is Vin's take on Kelsier's plan. It introduces us to lots of cool magic, including traveling by pushing off metals, which reminds me of the Lashings in Sanderson's The Way Of Kings. They also read a logbook about The Hero of Ages which is the third book in the series. Can't wait to see how that connects! So far I've enjoyed Mistborn, Warbreaker, Alcatraz Vs. Evil Librarians, The Way of Kings, The Rithmatist, and Steelheart. Hope to hit Elantris this summer and revisit Way of Kings next summer so I can read the sequel, Words of Radiance. I am an Amazon and Indiebound Associate. I'm looking forward to getting my reading mojo this summer. 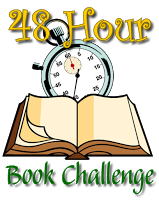 I participated in 48 Hour Book Challenge last weekend, as my schedule permitted. The theme this year was #WeNeedDiverseBooks and I was able to finish Prophecy by Ellen Oh which was ok but a little light on development. I don't see myself going any further in the series but who knows! I also read, and loved, The Great Greene Heist by Varian Johnson. This was a seriously fun read! I will be using it as one of my first book club books for 6th graders. 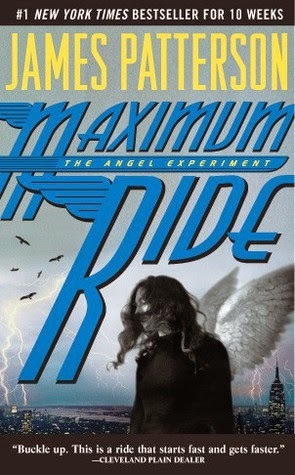 The pacing was just right and the storyline was fun and easy to follow. It will be interesting to discuss the reality of some of the pranks and see what we can pull off at school. I'll be on the lookout for some other heist-type or shenanigan-related reads for a full display. It was amazing to finish the Harry Potter series back to back. I needed an audio book back in April, picked up #1 and just couldn't stop listening. Though when the audiobook was checked out of the library, I did revert to reading the paper books. It was so interesting to reread knowing how it all ended, every conversation, every spell, every magical item took on a new significance. Well played, JK Rowling. It's Monday, What Are You Reading is hosted by TeachMentorTexts. Due to senior graduation (I can't believe my baby graduated! :() and many grad parties (I had many of these students in kindergarten!) my goal is to put in 12 hours. I have from now until Monday, June 9th, at 7am. I have about 2 hours before the next party. Let's get this reading party started! During the weekend of June 6, MotherReader will host the annual 48 Hour Book Challenge. This year the focus is #WeNeedDiverseBooks. All books read during the event, whether middle grade, young adult, or adult, should have a diverse focus. We are reading furiously to find our next One Book, One School selection. I'm lucky in that our Language Arts teachers choose great books to read and discuss with class and give students some choice also. Students still look on this as "school reading" and, as such, our goal is to encourage students to read for fun. We have trivia contests, game shows, a book battle, art/writing/music contests, and this past year, a scavenger hunt. The contests are based on the reading, which we divide over a month, and they can win prizes. We use the power of everyone talking about the same book as a way to encourage students to read. In addition, everyone who works in the building gets the book. We have a "formula" that we believe works, but we are also looking to branch out a bit. Hence, Super Human and Steelheart. I love superhero books. These also have great supervillians and focus on what is good and what is evil. We are also looking at Harry Potter because we think this group of students we have may have missed out on the books. I was lucky enough to meet Gae Polisner! Check out her Gae's facebook page for some great photos of the events she did for Reading For Life! 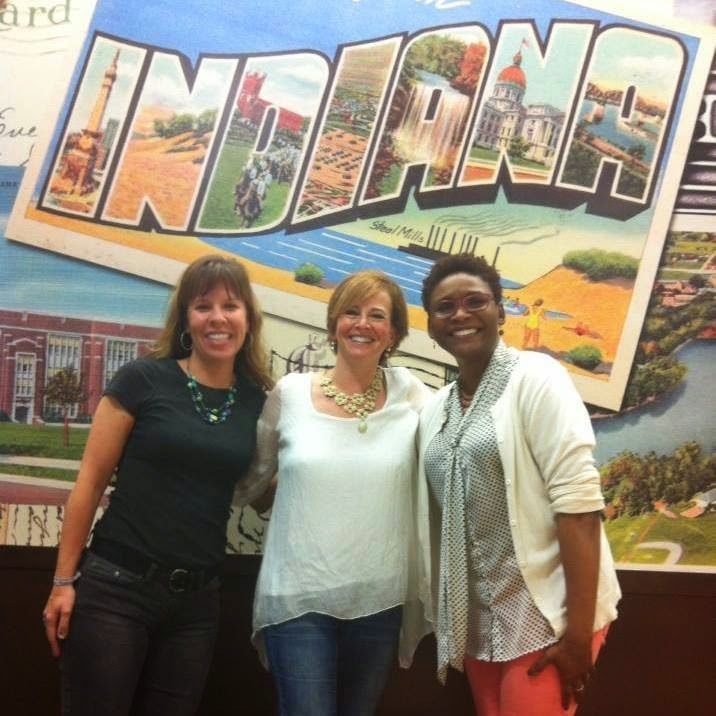 I also got to meet Kelly Vorhis (@kelvorhis) and had a visit with the great, Sherry Gick (@libraryfanatic)! We had a great time at our own impromptu After Party! Maria and I are doing something different for Batty About Books and so far, I don't like it! I miss her forcing me to check in partways through the book instead of waiting until the end! Though, I think it's the type of book we are reading too. We read scifi or fantasy each time and mostly feel as if our arbitrary divisions hinder our enjoyment because we remove ourselves from the reading to make our posts. I'm finding that the weekly breakdowns actually served to keep me vested when other chores were calling to me! Also, I miss the feeling of reading with Maria. Things might change this week when we write about the book. Can't wait.